Dollops of Diane: Seventh Generation Free and Clear Baby Wipes Review and GIVEAWAY! 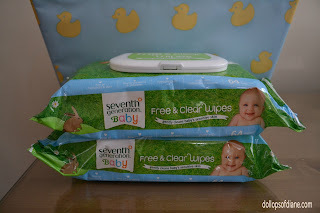 Seventh Generation Free and Clear Baby Wipes Review and GIVEAWAY! When I had my first baby I knew that I needed to buy baby wipes (duh!). However, I had no idea how much I would grow to NEED them. Now as a mom of three (and only one still in diapers) I am not afraid to say that I am obsessed with wipes. Even when I am going out of the house without kids (a rare treat!) I still bring a pack of wipes with me. The thought of being somewhere without them scares me because they are so gosh darn useful. So beyond the usual bum wiping I use them for cleaning off tables, high chairs, and you name it in public places. I use them around the house to dust the tables when I don’t feel like getting out all the cleaning supplies. I use them in the car to wipe off the dash board (although I should do it way more frequently than I do!). Oh, and let’s not forget when a poor baby doll (My Little Pony, superhero, etc) gets a little too messy and needs to be wiped off. Seriously, there are so many uses for “baby” wipes that I never knew. It’s like the moms of the world’s best kept secret. So I was beyond excited to receive a box of Seventh Generation Baby Wipes in the mail. Now I admit that I usually buy the store brand wipes since I go through so many that I like to buy them cheap. However, the Seventh Generation wipes are much thicker and bigger than my other wipes so I don’t have to use as many (score!). The first time I wiped my four year old’s face with them after lunch he said, “These are much softer than the other wipes!” Clearly, I’m raising the next generation of wipe fanatics! Some other fun facts about the new Seventh Generation Baby Wipes: With the new wipe they’ve reduced plastic use by 70% through the use of plant materials. As always, the baby wipes are free of alcohol, dyes, synthetic fragrances, parabens and phthalates. Wipes that are good for you and for the environment - what's not to love? Want to try out the wipes for yourself? One lucky Dollops reader will win a box of Seventh Generation Wipes! To enter, see the Rafflecopter form below!